Man, that show has a Princess for everything! These pages here are pretty bouncy inside, so mind you don't get bounced about when reading the examples in these tropes. Bouncing Battler: A character that primarily attacks by bouncing off surfaces. Cobweb Trampoline: Spiderweb as a trampoline. Gainaxing: Unrealistically bouncy breast movement. 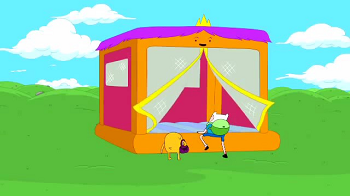 Gelatinous Trampoline: Jello as a trampoline. Goomba Springboard: Gaining a higher bounce from jumping during a Goomba Stomp. Hyper-Destructive Bouncing Ball: A small ball bouncing and causing a disproportionate amount of damage. Jiggle Physics: Simulation of non-rigid (bounce-able) objects on a computer. Rubber Man: Very extreme flexibility as a superpower. Rubbery World: A place where most things are made out of rubber. Spring Coil: A spring on a character's body or clothes that helps them bounce. Springs, Springs Everywhere: Video games with lots of springs and/or spring-like platforms. Springy Spores: Mushroom as a trampoline. Trampoline Tummy: Tummy as a trampoline. Tremor Trampoline: Floor dolts downward, character gets bounced upward from physics.